When you live in a war zone, you don’t have many options for work. Especially if you’re trapped in the confines of a refugee camp. 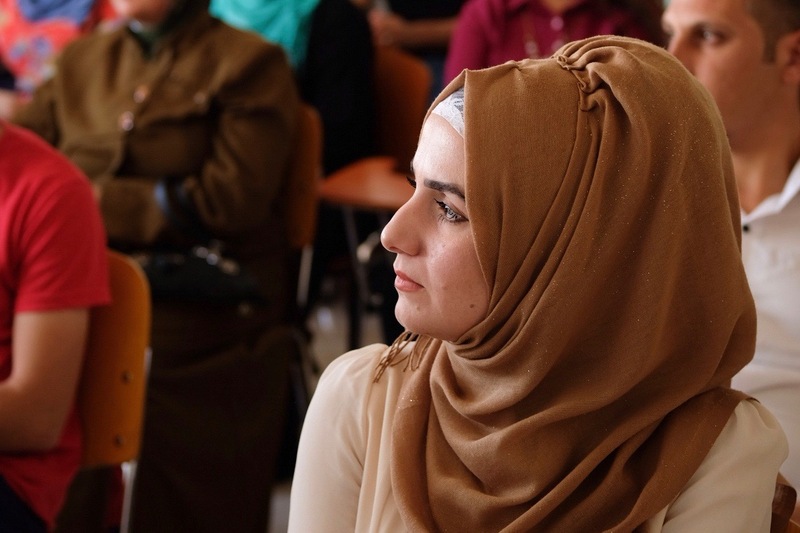 A young person in Iraq, for example, has basically two ways to earn a steady income. Try to land a job in the oil sector, which controls about two thirds of the economy. Or pick up a gun and join a militia—or, worse yet, one of the many terror groups that thrive on chaos. There just aren’t many opportunities for young people here. And perversely, it’s this lack of opportunity that makes the next war even more likely. War has an outsized impact on entire generations. But one of the most promising antidotes to war is surprisingly small: microwork. Microwork has been touted as an answer to poverty for years—and with good reason. But solving poverty is only part of its potential. Microwork divides one big project into several small tasks, which can be completed individually, by different people online. It’s not exactly a new idea, just a new application. Microwork is the 21st-century equivalent of the assembly line pioneered by Henry Ford over a hundred years ago. Except that people working on a digital assembly line don’t all have to be in one place. They can be scattered all over the world. They could be in Syria or Iraq. They could even be living in a refugee camp. Each microwork task is highly repeatable. They can be done quickly, many times over. But it’s not the kind of work that can be fully automated. It still takes a real, live person to do. The fact that you can do microwork from anywhere is what gives it so much potential to alleviate poverty among the marginalized. Minorities who face discrimination in their own communities can find work outside them. Iraqi young people of all stripes—Arab and Kurdish; Sunni and Shia; Muslim, Christian, and Yazidi—are working toward a new future, together. Women who are discouraged from leaving the house because they are trapped in a male-dominated culture—or who feel pressured to choose between their children and their career—can earn a living from home. Those with limited mobility—who don’t have access to mass transit, or those who have a disability that makes it difficult for them to travel—can work with dignity right where they are. Those stuck in a refugee camp, who can’t go where the jobs are… what if the jobs came to them? Sometimes the arc of the moral universe bends too slowly toward justice. Not everyone can afford to wait for it to bend enough to enable them to provide for their families. Microwork may not be the answer to every systemic injustice. But it can stop violence and marginalization from having the last word. Iraq has been in a state of nonstop war for over 15 years. Nearly half the young adults here are out of work. Most of the “good” jobs are tied to the oil industry. The tiny fraction of Iraq’s economy that doesn’t depend on oil shrank 22% in the years since ISIS stormed the country. In addition to the millions of Iraqis who lost their homes to ISIS, millions of Syrians poured over the border to Iraq, fleeing war in their own country, and putting even more strain on an already fragile economy. As a result, poverty ballooned more than 20% across Iraq. In areas held by ISIS, the poverty rate more than doubled. Even though ISIS has lost its territory, the damage is done. Young people face a future that is arguably worse than what their parents lived through under Saddam Hussein. Young people in Iraq have few ways to earn a living that aren’t tied to war. Natural resources are scarce—and the one resource Iraq has an abundance of, oil, is often at the very center of conflict. The country faces both sectarian tension and a population dramatically enlarged by the refugee crisis. We can create thousands of tech jobs. Right here in Iraq, right now. For young people, for refugees, for people with disabilities. As the war with ISIS wore on, we were dreaming of a way out of this mess, out of the seemingly endless cycle of violence. What if we could give young refugees a way to work right where they are, without having to leave the country in search of a better life somewhere else? What if we could give them skills that are worth more than the certificate they’re printed on—skills they can use to find work now? This is more than an investment in jobs or economic growth. This is an investment in peace. What if we could help them overcome barriers that keep them from accessing the global digital marketplace beyond Iraq? What if we could provide a space where they can continue to hone their skills and collaborate with people from all backgrounds, religions, and identities? So far we’ve launched four tech hubs across Iraq, including one in the former ISIS stronghold of Mosul. Students who come to these hubs can earn a living while they develop skills that will allow them to have a flourishing career for years to come. They learn English—a vital gateway into the tech world. They sharpen their IT skills. They build their resumes and portfolios, maximizing their chances of finding work. All while earning income now, doing microwork for clients around the world. Nearly 1,000 young women and men came through our tech hubs last year. Nearly half are women—no small achievement for a country where only one in five women can access the workplace and for an industry that is notoriously dominated by men. Five months after they complete their training, two out of three students are either working or continuing their education. Of those who work, over half earn more than the average monthly income in Iraq. But maybe even more important than what they earn is how they are transformed. Almost every participating student reports increased confidence. And 94% say they are more comfortable working with those who are different from them. But they cannot do it alone. Thousands of young people, including those in remote parts of Iraq where terror groups prey on desperation, still need their chance to find meaningful work. They need their chance at a better future. Microwork works. It can disrupt the cycle of violence by giving the vulnerable and marginalized another option, another future. This is more than an investment in jobs or economic growth. This is an investment in peace. Give today—and create thousands of jobs for vulnerable young people.